One of C's favorite words right now is "Bear." She points to each of her furry guys and says ... well, actually she says what sounds more like "Beer." Every time she says it, I repeat, "Baaaaaaare." Please, daycare providers, do not get the wrong idea. Yes, there has been a lot of eating lately. And it hasn't been just the occasional donut or *gasp* Pop Tart. There have been Grand Marnier chocolates, truffles, gourmet donuts from Rustic Canyon that you dip in "hot chocolate" (high-five, Kathy!) and even high-end Little Debbie oatmeal cream pies filled with maple-vanilla buttercream (more on that later). Well, mister/sister, now you can add bacon donut to that list! Did I say that out loud? Wow, my mother-in-law is seriously going to kill me. 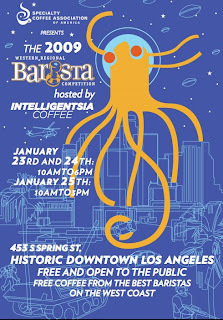 Today, C and I met my food blogger friend Pat, of Eating L.A. fame, downtown at the Spring Arts Tower to catch the 2009 Western Regional Barista Competition hosted by Intelligentsia Coffee. I love coffee as much as or more than I love donuts. And I was not about to miss this opportunity for gratis cappuccinos from the top region al baristas. While we were there, we stopped by the only food-focused booth, hosted by Cake Monkey Bakery. They knew Pat from her blog and gave us some samples. Their specialties are mini layer cakes and snacks made in loving homage to Little Debbie. After we left the barista wars of 2009, we headed for the morning's piece de resistance (which Pat had blogged about last month). The Nickel Diner, on 5th and Main. This is where the unholiest of holies is located. The bacon donut. And as much as I wanted to turn up my nose in donut snobbery, I was mystified. And in the end, completely sold. You'll be happy to know that since I'd had my Lil' Merri, I waited to eat the bacon donut. But I didn't wait long. So I did a little bit more digging and found out that Madame Chocolat offers much more than just peanut butter ganache bonbons and dark chocolate truffles. They also offer birthday parties for children. Owner/chocolatier Hasty Torres was kind enough to email me the deets. She says the shop hosts children's parties (ages 5 and up), where the kids can make their own chocolate lollipops to take home. I know C is only 2, and we barely finished celebrating that birthday, but I'm already planning for No. 5 (age, that is, not my fifth child. Seriously, God help us if that were on the to-do list). But you can never start thinking about birthdays too early. Particularly in L.A. And particularly when they involve chocolate. I'm also including an image of the invite for the Singles Mingle Night I mentioned in my earlier post. Looks like it could be a fun evening out. In fact, I wonder if you really have to be single. Seriously. I mean, all's fair in love, war and chocolate, right? At the very least, I'll be counting the days until C's 5th birthday. My friend Vickey had her baby shower today at Madame Chocolat in Beverly Hills, and boy (actually, twin boys! ), did we redefine the word indulgence. Vickey looked great, and I have to not only applaud her but also get up and give her a standing ovation. She has a son who's about C's age, and she'll soon have two more boys to add to her nest. Give the woman all the chocolate she wants. Oh, and speaking of Oompa-Loompas, Madame Chocolat is giving out a "golden ticket" with certain purchases. 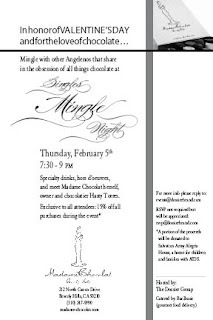 They're even holding a "Singles Mingle Night" in honor of Valentine's Day on Feb. 5 from 7:30-9 p.m. They'll be serving hors d'oeuvres and specialty drinks and offering 15% off all purchases during the event. Forgive me for being so president-focused lately, but blame it on the times. I found this video of the Bush twins reading a letter to the Obama girls, giving them advice on life in the White House. It's very sweet and quite poignant, particularly the parts about making sure to have swim parties, playing sardines on the lawn ... and remembering who their dad really is. A lot of what they say applies to kids everywhere, in and out of the White House. On the new president's first full day of work -- and work it will be, given the tough spot our country's in right now -- I'm thinking about all the big events that were happening to me around the time of the last inauguration in 2005. I wasn't married then (but engaged and planning a wedding) and didn't have a child. I had recently started a new job and was given more responsibility there. And I was thisclose to hitting that major milestone -- the big 3-0. Although C doesn't know it, she's in a new era. She doesn't know about racism, and by the time she's old enough to answer "Obama" when someone asks her who the president is, she won't know that we ever had a president who wasn't African-American. Truthfully, it probably won't occur to her even then. When the next inauguration rolls around in 2013, C will be 6. I hope for her that the road between now and then will be steady, that the economy and the world will right itself and that she will only vaguely realize how historic yesterday was -- because having an African-American president will be nothing new. It will just be the way it is. To live, eat and ice in L.A. 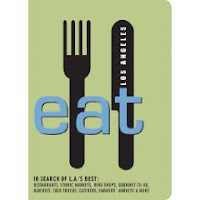 Wanted to give a shout-out to my friend Pat Saperstein from work and her new book EAT: Los Angeles. Being a food blogger nonpareil at Eating L.A., she served as a contributing editor on the guide, which was spearheaded by Colleen Dunn Bates. C and I picked it up at Book Soup on Sunset (which earlier this month lost its founder, Glenn Goldman) as we were taking the scenic route to Santa Monica this afternoon. When I have the patience of Job, or the illusion that I have the patience of Job, I like to take this winding drive down Sunset through the estates of Beverly Hills, past the little shops of Brentwood and up and down the hills of the Palisades before finally hitting that jaw-dropping view of the Pacific. It's one of the reasons I love living here. Today, we were on our way to see something almost as mythic as that bibli cal man of eternal endurance -- the ice rink. In January, yes, but in sweltering southern California temps. Nearly blinded by the sun, C and I walked past the corner of 5th and Arizona to find teen girls and boys and parents with their young children taking to the ice as if it were Central Park in wintertime. Some even wore scarves and knit hats with their short-sleeved shirts for the occasion. It was the last day of the event, which began in early November. (There's also Downtown on Ice in Pershing Square, which also ended its run today.) So I guess tomorrow we'll be back to the same blue skies and blazing sun, only without that illusion of winter that reminds us just how lucky we are. In honor of Martin Luther King Jr. weekend, C and I headed back down to Exposition Park to visit the California African American Museum. Anyway, I thought it was important to visit the museum on this particular holiday in this particular year, when we're about to make history as a nation. I know C doesn't realize the importance of what's going on in the world. In fact, she might think this is just one more place Mom takes her where she's not allowed to touch anything. But I wanted her to have a connection, even if to her it's just looking at pretty pictures. Lucky for us, it was also Target Sunday at the museum, where admission was free to all the exhibits and included music, speeches and a kids' workshop. Not to get schmaltzy, but it was pretty moving seeing all of these children of different races sitting around a table making crafts together. Unfortunately, it was a little too much for C, who instead wanted to take in the artwork, sometimes at high speed. Let's just say there were a few threats of going home when she decided to use the museum as her personal racetrack, darting and weaving through glass-enclosed (read: expensive) artifacts in an effort to lose her mother. But the chase was worth it. Today was a hot, dry, sunny, Southern California afternoon, where my child was in shorts and a ponytail wandering through history, getting a glimpse of the future, and feeling completely at home the whole time. I had to record this, just for posterity. Notice how shiny and pink C's blanket was when she was a mere 2 months old. 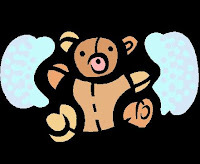 Little did my stepsister, Emily, know when she sent it that this "snuggly," as daycare calls these sorts of things, would become more important than any doll. Heck, more important than food. Now it's a mere carcass of its former self. It looks as if it's been run over. Multiple times. If there were "Wanted" posters for blankets, this would be ... actually, it wouldn't even be on there. It would be "Unwanted." But C loves it. She can't go anywhere without it. And although I cringe every time she asks for it, or brings it into bed with her and her clean clothes and sheets, I'm also not going to deny her something that obviously comforts her. Unless it's crack. That, C, I will deny you. This weekend we headed down to Trojan territory (USC-adjacent, that is) to visit the Los Angeles County Museum of Natural History. My friend Kirstin from work was kind enough to give us a family membership for C's birthday, and man are we going to swipe that card 'til it smokes. It's great, kid-friendly. In fact, there seemed to be more kids there this weekend than adults. They have cavernous halls dedicated to animal life scenes that included lions, musk oxen and bears (oh my). C was a little nervous around the giant elephants and water buffalo, but at some point, it's time to introduce children to real life, no? We even got to stop by the members' lounge, complete with stuffed dinosaurs, animal puzzles and coffee and chocolate for entertaining parents. C loved it. Loved exploring everything, loved running into older kids who wanted to touch, see and know about each animal. She was fascinated, which made me happy. On the way out, I was wondering where her beloved "pink" blanket was. If you don't know C, she's attached to her now-filthy blanket as if they'd bonded in the womb. She wails without it. When I didn't see it, I thought maybe we, luckily, had left it in the car. As we were walking back the parking lot, though, I happened to look down and see it -- wait for it -- in the dirt. Dirt! And it blended in so well I had to look twice. It wasn't some shiny pink oasis amid a sea of brown. No, it was very close to the color of the ground. I was actually too ashamed to take a picture to upload here. But I picked it up, shook it off and reluctantly brought it back to the car. I can only imagine what kind of disease is living in that thing now. Even after a good washing. And, the horrible thing is, she saw it, which meant I had to give it back. High-five, Kirstin and David! Couldn't have had this day without you. Just wanted to give a heads up that my first post went up today on LA Moms Blog. Yes, as you may have expected, I got my neuroses on. Big time. This time it was about me freaking out when I saw a woman crossing the street who looked exactly like -- and was dressed exactly the same as -- C. Same outfit, same blond hair, same features (plus 30-35 years, give or take a Botox shot.) It was eerie and made me want to hide my child, just in case she mistook this woman (instead of her dark-haired, dark-eyed real mother) for her own flesh and blood. I might have overreacted, but I did get to use the word "Mommelganger." You are looking at (well, reading) the newest contributor to the Los Angeles Moms Blog. I will be posting my latest adventures in motherhood to this blog group that started out in Silicon Valley and has grown to include moms in New York, D.C., Chicago, among other cities. The women I've chatted with via email sound welcoming and great. But, I have to admit, it sort of feels like the first day of school when you're terrified you might trip, fall and bleed everywhere, in the process ripping your pants to reveal that you accidentally chose to wear "I Love John Stamos" underwear for God knows what reason ... and that's before the really embarrassing stuff starts. Anyway, here's hoping they don't kick me off for being that kind of parent ... whatever that kind means. Oh, and those posts will be separate from the ones I log here on L.A. Story. Yes, Grandma's visit was fun, but sometimes it's the awkward moments, the crying, the screaming -- especially when it's captured on film -- that you look back on with the most laughs. Take the above photo. High-noon temper tantrum at the Autry museum. Forget the tranquil-looking waterfall in the background, it's the raging stream of tears that makes this moment special. And I've never wanted Botox in my life ... until I saw the Royal Gorge of a crevasse between my eyes in this pic. You could seriously send burros down that thing like they do in the Grand Canyon. Is there a needle big enough, a face cream strong enough? Vain? Maybe. But I'm reminded of something my friend from work Vanessa came up with at her Little Gray Pixel blog. Vanity = sanity. I call this the spit-take. My mom was gargling in an effort to fend off any unwanted germs, and C wanted in on the action, too. You should've heard the noise that came out of my baby's mouth just before she spit God-knows-what into the sink. New Year's Eve tantrum. Trying to smile through the pain. This was just before Ian and I went to the Dresden. What about my vodka martini, Mamma? !, I imagine her screaming, in bunny slippers, no less. ... God, I hope she never screams that. And, finally: Don't even think about calling me Baby New Year! This post is a shout-out to my mom, who was a tremendous help these last two weeks. Not only did she get a lot of bonding time in with C, she also saved Ian and I from nervous breakdowns while daycare was closed for the holidays. What's your name? C (while pointing to herself): CC! How old are you? Tooooooo! She also learned how to blow bubbles (as you can see above) and blow out candles. Big milestones. Glad you got to be there for them, Mom. For my mom's last full day in town, we had an all-girls brunch on Larchmont Blvd. We stopped in at Cafe du Village, which is between Beverly Blvd. and 1st St. It's a cozy little French cafe (see the orange awning above and to the right) with Provence-style decor, quick service and delicious fare. I went for the banana pancakes and cappuccino, while my mom ordered Le Croissant au Saumon. C opted for biscuits and sausage. There was no rush, so it was a nice way to spend a Saturday morning with my mom and daughter. We'll have to make a return visit with Ian as well. Larchmont Village itself is adorable. The street's lined with small shops and restaurants, a mix of chains like Starbucks (and Coffee Bean and Peet's -- all within a block of each other!) and Pinkberry alongside locals such as Spirituali and Landis General Store. This is Larchmont in 1932, looking south from Beverly Blvd. The building on the left is now home to Noah's Bagels, and Coldwell Banker now sits on the right. Streetcar tracks run down the middle. And this is Larchmont in 1948, looking north toward the Hollywood Hills, which you can see faintly in the background. Notice the streetcar was still running. After the champagne cocktails, the noisemakers and the fireworks, I decided it was time for buffalo burgers, bold caballeros and big ol' stagecoaches. Yes, after a night with Marty and Elayne, New Year's Day was ripe with opportunity for a trip to the Old West. Not only is there an outdoor area where children and adults alike can climb into an authentic stagecoach, pan for gold and take a peek into a faux general store, kids can also don cowboy gear and saddle up on a life-size replica horse and pretend they're riding the range -- with chaps and all. Inside the museum, kids (I say "kids," but I'm sure your feisty Western obsessive who's still trying to shake off that New Year's Eve old-fashioned would be welcome, too) can hop on a horseless saddle mounted in front of a blue screen and watch as they appear in a video complete with desert backdrops and chase scenes. According to its website, the January calendar includes such family-friendly events as making Pancho puppets inspired by characters of the Mexican Revolution and calendar sticks like the Plains Indians once did. Oh, and there's art, too. It's that time of year, the first day, and one that leaves people with hope and/or anxiety about what they want to achieve over the next 364 days. In addition to my general 2009 goals of wanting to clock more time walking (running only gives me unwanted heart palpitations and nervous tics similar to Turrets Syndrome) and increase my motivation to cook homemade meals (pasta doesn't count), I also have some goals for this blog. I would like for C and I to visit even more Los Angeles hot spots that are kid-friendly and reasonably priced. I'm also planning to make new connections with other mom bloggers around the country. Improving the overall look and feel of the blog is an important goal for me. Hoping, too, to draw in more readers. And, finally, although I'm sure more will pop up as 2009 rolls on, I would like to increase my number of posts. My fellow mom blogger over at Ask Baby Kid rounded up a few other bloggers, L.A. Story included, to share their blogging goals for 2009. 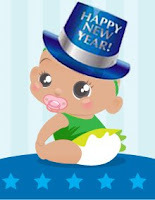 She even created the cute Baby New Year logo above. Her site is full of great tips for moms and mom bloggers. Check it out, as well as her others: Cool Baby Kid and Smart Baby Kid. In the meantime, have a wonderful and prosperous 2009. And I wish you all the teeth-grinding, nail-biting, Turrets Syndrome-inducing motivation and drive to reach every one of your goals.